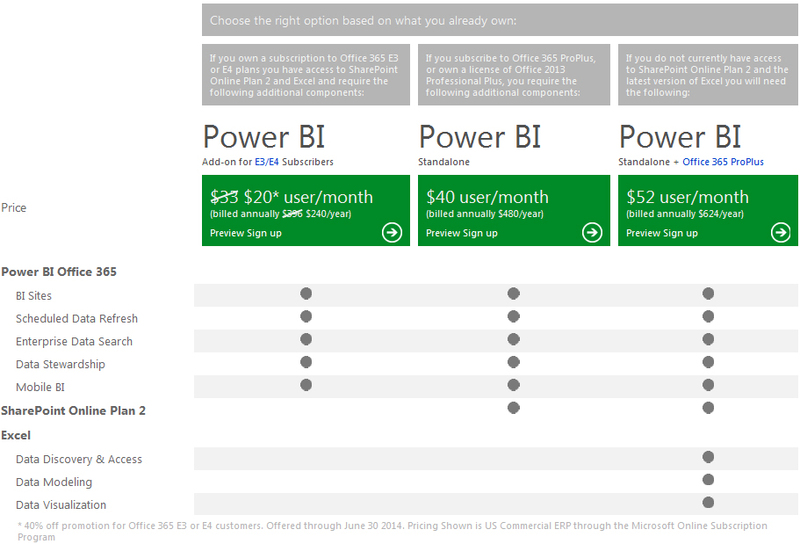 Microsoft recently posted the pricing details for Power BI, its suite of solutions designed make it easy for Excel users to create visualizations from collections of data. Microsoft first unveiled Power BI at the 2013 Worldwide Partner Conference and then released various updates to it late last year. While Power BI is currently still in the "preview" stage, the prices for the product are now available here, as noted on Monday by ZDNet's Mary Jo Foley in an article. The pricing for the suite varies because organizations may already be licensed for some the components. A Microsoft spokesperson indicated Tuesday that the company plans to announce the final Power BI product "early this year." The preview version is free to use in the meantime.